Irish surgeons needed to work fast to cut off a limb of a fully conscious patient in Georgian Dublin. There were no painkillers for those patients who remained awake as the surgeons wielded their knives 200 years ago. The early days of Irish surgery will be recalled at a public talk to be given this week by Susan Leyden, archivist of the Royal College of Surgeons of Ireland (RCSI). "Surgeons' reputations were based on how fast they could amputate a limb," said Ms Leyden. "Surgery was considered to be a skill like that of a carpenter. It was a very manual profession," she said. 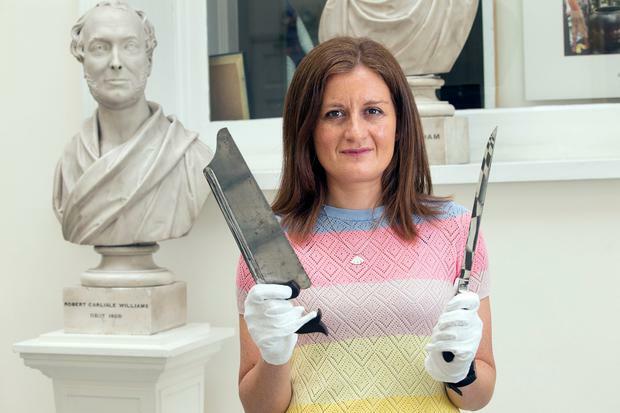 Ms Leyden (38) curates a collection of antique surgical instruments, illustrations, documents and medical books from a bygone age. The gruesome experiences of patients two centuries ago make modern problems of trolley numbers and hospital waiting lists seem almost trivial. The bloody land battles and naval battles in the late 1700s gave rise to increased demand for surgeons. The establishment of the Royal College of Surgeons of Ireland in 1784 resulted in hundreds of students joining the Dublin school to learn how to perform battlefield surgery. Before the college was founded, surgeons were apprenticed to barbers who were members of the Barber Surgeons' Guild, she said. The traditional barbershop red and white pole symbolised blood and bandages. Patients would grip the pole tightly to bring up the veins on their arms, if needed. To this day, a barber's pole is still used at ceremonial occasions at the Dublin college. The need for better battlefield medical care sparked innovation. Richard Butcher, a president of the college in the 1860s, developed a surgical saw with an angular blade. He was inspired by watching carpenters use a similar device for cutting wood. His new saw allowed surgeons to cut through bone even faster. The saw is in the college archives and is known as 'The Butcher's Saw'. Another piece in the archives is a beautiful mahogany box containing the knives and saws of an army surgeon used in the Crimean War in the 1850s. One of the more formidable pieces of equipment is an instrument which looks like a cross between a corkscrew and a vegetable peeler - though it was not designed for the kitchen table. 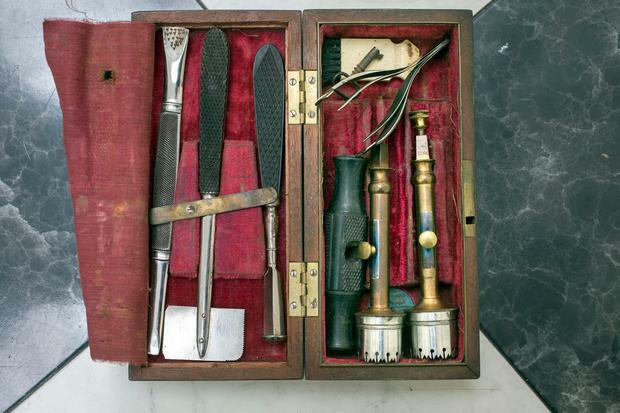 It is a called a trepan which was used to bore into the skulls of patients manually. The trepan was further developed by Samuel Croker-King, the first president of the royal college, who commissioned a Dublin cutler to make it in 1791. Another college president, Jolliffe Tufnell, served in the Crimean War and invented a device widely used on shot soldiers which was called a 'bullet scoop'. But the most widely used invention by any member of the college was that by surgeon Francis Rynd who achieved a world first by inventing the hollow hypodermic needle in 1844 - creating the world's first injection. His device did not have a plunger but his hollow needle used gravity to inject morphine into a woman suffering agonising pain in her eye and face.